That's where freeze dried lightweight hiking food enters your backpacking plans. Want to cut to the chase and calculate your backpacking food requirements? Use that handy link for more hiking nutrition info. Otherwise, let's have a look at each of these factors in turn. Because you want the best hiking food for your backpacking trip, right? And you want the right answer to the question of what food to take backpacking to keep you going day after day. Weight is a really important variable in the enjoyment and success of a multi day backpacking trip. In my mind, it's the most important consideration! I'm willing to pay more for lightweight food options, and if they're nutritious and flavorful, so much the better. But if my pack is too heavy, I'm not going to have a great trip (at least not the first few days). Heavy pack = stressed leg joints = frustration or injury. So I take a really close look at the weight of every possible food item as I plan a realistic backpacking menu. And here's another consideration: If water is scarce along your hiking route, add that into the weight of the dehydrated or lightweight food you're carrying. Every ounce of water is heavy, and when you lift a filled liter bottle of water, you are seeing the force of gravity up close and personal. And it can get ugly in a hurry, hiking through hot dry areas. Skimp on anything else except your water intake! When I first learned to backpack, lightweight food options were whatever you could find on a grocery store shelf: chicken bouillon cubes, "minute" rice, crackers. And I fondly recall "astronaut ice cream" back when the USA space program was in its heyday. In today's world, the options are staggering. You can go the easiest route: purchasing dehydrated entrees in pouches, all ready to receive hot or cold water for rehydration. You're going to have to carry a stove and fuel, so indirectly that adds to the weight (and cost) of the food. Note that "easy" comes with a higher price tag than the other options I'll mention in a moment. The dehydrated brands I've tried include Backpacker's Pantry, Mountain House, and Natural High. my taste buds were kept decently entertained. to save money and to sample their meals until you build up a "Favorites" list. Also, take the recommended rehydration time with a grain of salt, especially if you're at higher altitudes. I usually double it (while chewing on my thumbnail with impatience). A close second is Mountain House. I've been eating this brand of backpacking food since the 1970s. Read my recent review here to find out why. The second easiest route is to cobble together your own meals, using easy to find ingredients in the bulk bins of your favorite grocery store. It's also a way to plan cheaper backpacking meals. Dried beans, rice, grains are easy to rehydrate on the trail, especially if you carry an extra water bottle and soak them during the day's hike (uses less fuel, and guarantees they'll rehydrate, thus sparing you digestive distress). Putting together your own "spice kit" can jazz things up. And note that some spices are digestive aids - ginger, tumeric and basil, for instance. I don't know about you, but my gut really knows the difference between "at home" food and trail food! Anything I can do to help my digestion, I will do. My tent mates appreciate it, too. If you need some backpacking food ideas for combining common ingredients into great backcountry fare, I'd recommend this site: Backpacking Chef. He not only gives you recipes, he walks you through how to dehydrate your own food! Definitely great reading if you're planning a trip on a budget. The most time and labor intensive route is to plan all of your backpacking food ideas around "from scratch" recipes. To me, this defeats the purpose for hitting the trail. I want to leave pots and pans, clean up chores, and recipes behind in the kitchen, and focus my efforts on the scenery. But if you're a back country gourmet, have at it! Be careful about the water you use for rehydration: filter or boil or treat it so you don't get "extra" protein in the form of nasty critters in your food. 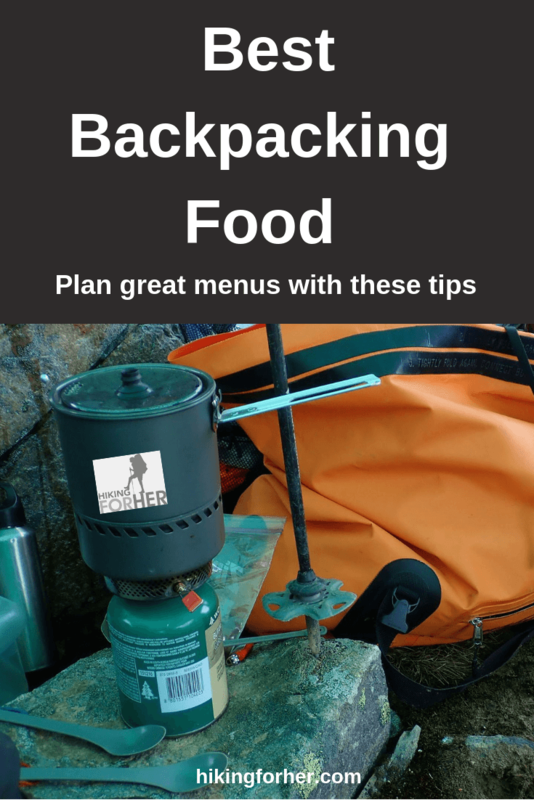 Also, be sure the packet of dehydrated backpacking food is standing upright and propped up by rocks or whatever is handy, so when you pour in the boiling water from your backpacking stove, you won't get splashed. And a bandanna or extra sock makes a great hot pad! Read these tips if you need to go gluten free. Or these tips to go paleo. Lest you think I'm completely oblivious to the taste of trail food, let's cover the importance of flavorful food during a backpacking trip. You're going to be pushing your body harder than usual. You'll have to pay close attention to hydration (water in should exceed water out). Be sure you're playing the "what color is my pee" game - and the winning answer is pale yellow or clear. Food will begin to preoccupy your mind as you hike. When is the next snack break? How much trail mix do I have left? It's important to choose trail food with a flavorful punch because you don't get to eat unlimited amounts of food (unless you have a team of yaks or llamas, or a helicopter resupply crew - in which case you probably have a personal backpacking chef, too). So what you eat, you've got to taste -and enjoy- big time! It's important to know which tastes and flavors you really like, and which you have aversions to, as you choose food for your trip. Read the ingredient list carefully. If you're preparing your own entrees, estimate the quantities of spices and flavorings you'll need, and then put in a bit more in case of spillage, mold, contamination, or cravings. Some backpackers pick a theme: Italian food all week. Other people like to mix it up every day. And some, like me, are monotonous eaters: more focused on nutrient density ratios and not really needing strongly flavored foods to be satisfied. Yes, I like to feel full after a meal. No, I don't need to burp up oregano for hours to feel like I've had a great dinner. If you're looking for anti-inflammatory spices to help damper the daily accumulations of joint and muscle soreness, try curry (turmeric is your friend!) dishes. Just a cautionary note: Don't overdo the spices and salts and flavorings if you're not used to them in your daily diet. Indigestion is not fun during a backpacking trip because it robs you of sleep (after dinner), trail energy (after breakfast), and peace of mind any time. Do you really have the extra energy to play a little game called What's going on in my gut?? As already mentioned, weight and cost are linked to some extent, along with convenience, when discussing backpacking food ideas. If you have all the time in the world to dehydrate your own carefully sourced food, you're in a position of strength in terms of mastering the major factors in backpacking food ideas. Realistically, most of us have to trade one factor for another. I've already disclosed that I'd prefer to pay a bit more for the convenience of lightweight, prepackaged, designed by someone else, meals. Back in my student days, it went the other way - less money, more time, more incentive to cobble together my own backpacking meals. To whatever extent you can, please give your hard working body the nutrients it requires to perform well on the trail. While carbohydrates are fairly inexpensive (grain based items such as bread and crackers), protein and fat have heftier price tags. A small plastic container of high quality olive oil will make your cell membranes happier than a cheap lower quality oil such as corn oil. If you can afford it, use the best source of fats that you can. But here's the thing: if you're filled up with high quality protein, you're not as hungry, not as prone to injury, can recover faster from muscle strains, and your body isn't sending you "I'm so deprived" signals. to eat well on a backpacking trip? Here's what I bring along on every trip: Vacuum sealed packs of fish. Salmon is a great "oily" choice which cuts down on the need to carry additional oils, and it's so very tasty. But high quality protein sources are going to cost money. The question is: Are your muscles (including your cardiac muscle a.k.a heart) worth it? None of these salmon sources are cheap, but all of them are worth the price because my muscles (and taste buds, to be fair) really crave protein after a few days on the trail. Here's another source of good fats and protein that rides along in my food bag on every hike, regardless of length: nuts. But only bring the best nuts! Another reliable source of hiking nutrition: nut butters. I'm partial to almond butter, but my taste buds are no strangers to peanut, cashew, and hazelnut butters. Sometimes you can add in maple syrup and cocoa powder to jazz things up! My currently favorite brand is Justin's, in small squeeze packs that count as one of my ten essentials: extra food. Because they're small and lightweight, and have a long shelf life so I can stash some in my survival kit and rest assured that I'll have reliable nutrients in an emergency. Confession: I eat these as snacks on non-hiking days, too, with celery and carrot sticks. Dee-lish! So don't be shy about enjoying your best hiking foods every day of the year. If the whole idea of hiking nutrition is a snooze for you, skip the rest of this page! If it's not, but you're pressed for time, check out my hiking nutrition tips here. 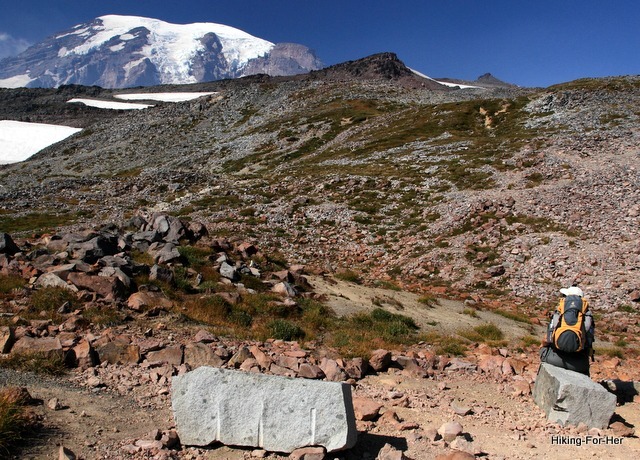 You can also hop over to some of the best backpacking nutrition tips here. 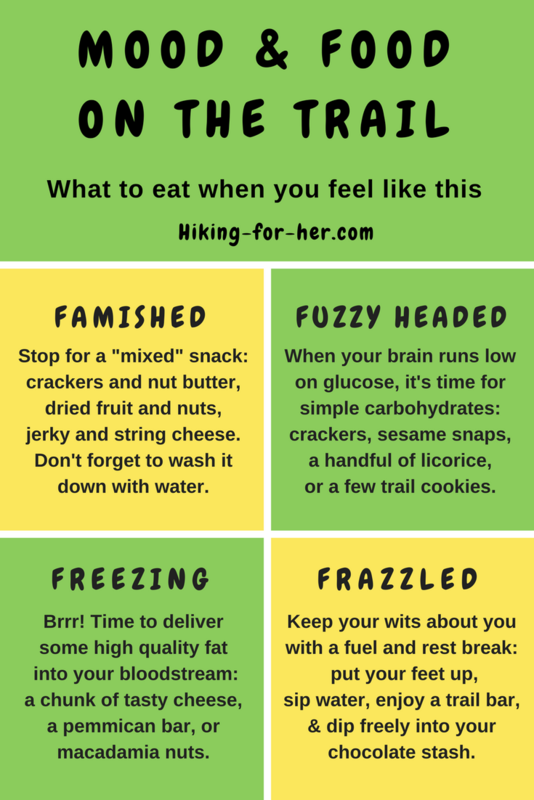 Example: Candy bar in, crash and burn within an hour on the trail which leads to needing more food, reduced mileage, or a headache. Another example: Cheap dehydrated backpacking food filled with preservatives and chemical flavorings day after day fool your taste buds but not your hardworking liver, pancreas, heart and skeletal muscles. So choose your trail foods not just for weight, flavor, convenience and cost, but for the real reason you eat them: good sources of fuel for the cellular machine you call your hiker's body! Organic backpacking food might be the best hiking food for your trip. Remember, it costs fuel to do work. If the work you're doing takes you to gorgeous places like Mount Rainier, use high octane fuel!! You won't regret it. It's easy to fall into a rut, whether on the trail or in your camp kitchen. Use these easy as A-B-C tips to keep your taste buds happy while your body is well nourished and satisfied. And if you haven't put together your backpacking kitchen essentials yet, get started here. You might also like some specific Backpacking Food Ideas.